Community Hospice Foundation is a non-profit hospice organization providing end of life services to families in the central valley, regardless of their ability to pay. Because of Community Hospice, my dad was able to spend his final days at home, in Merced, comfortable and surrounded by friends and family. They supported our entire family through the process and continued to check on us kids after he passed. In what might have been the slowest rappel of the event, I took my time and focused on not completely freaking out. My family and many of my friends had come down to watch me and as I started to make my descent I could hear them yelling their support... which totally helped me! I could even hear Avery, who, at 4 years old, could be heard screaming "GRANDPA!". I didn't know until later that she more than a little nervous that I was going to fall right off that building. I'm glad I brought my GoPro. So I could forever re-live it and watch the terror on my face. Here's the rappel, from start to finish. I owe a huge debt of gratitude to everyone that donated to this cause to help me meet my $1,000 goal, and to everyone who encouraged me along the way and during my descent. There is no way I could have done this without y'all. 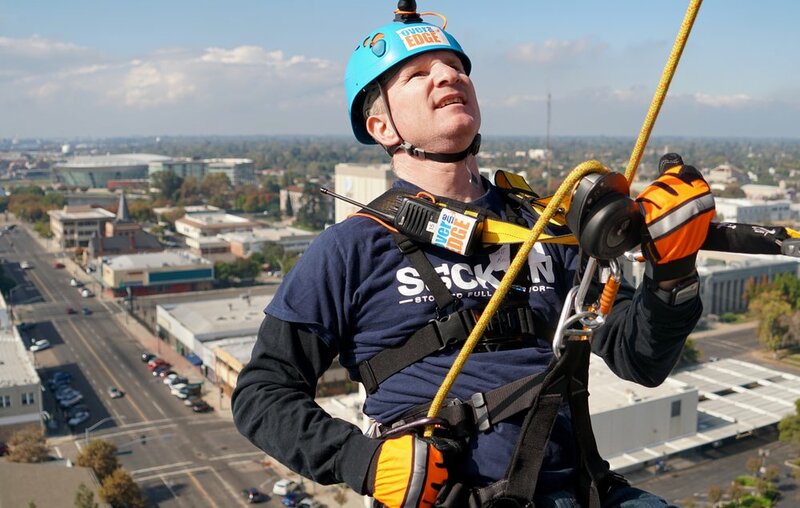 Community Hospice and Ten Space is doing it again this year, Over the Edge returns to the Medico-Dental building on October 20, 2017. Sign up or donate some money to this year's participants.